Discovery (STS-128) Lands in California. The Japan HTV/H-IIB Successfully Launched. On September 10, 2009 he Japan Aerospace Exploration Agency (JAXA) launched the H-II Transfer Vehicle (HTV) aboard the H-IIB Launch Vehicle Test Flight (H-IIB TF1) at 17:01 UTC (02:01 a.m. on September 11, 2009 Japan Standard Time, JST) from the Tanegashima Space Center. The launch vehicle flew smoothly, and, at about 15 minutes after liftoff, the separation of the HTV Demonstration Flight was confirmed. STS-127 on the way back letter. 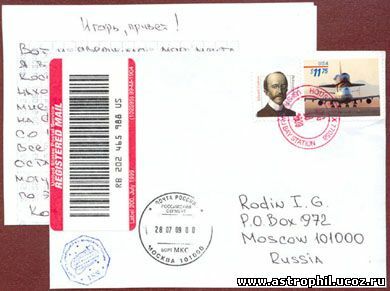 The letter was written aboard the ISS by Russian cosmonaut Roman Romanenko. Space Shuttle Discovery (STS-128) Undocks from the ISS. STS-128 / ISS, the 3rd EVA. 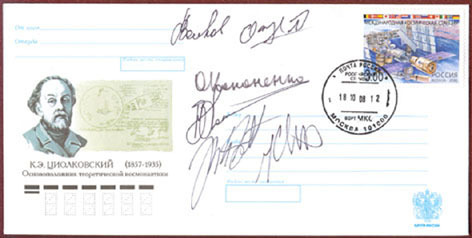 Official Post Mark (Cancellation) aboard the ISS!!! STS-128 / ISS, the 2nd EVA. At night from the 3rd to the 4th September, 2009 astronauts John Olivas and Christer Fuglesang performed a 6 hours and 39 minutes spacewalk. They installed a new 1,700-pound ammonia coolant tank in the International Space Station's truss backbone. The spacewalkers returned aboard the station at 04:51 UTC. Discovery (STS-128) docked to the ISS. On August 31, 2009 Space shuttle Discovery docked with the International Space Station at 00:54 UTC delivering more than seven tons of cargo and a new crew member to the International Space Station and its Expedition 20 crew.